A Russian palaeontologist’s quest to find ancient beasts and unicorns. There’s an old Soviet joke that satirizes the USSR’s penchant for declaring itself a leading force in various fields. It goes like this: During an international competition, schoolchildren from several countries are challenged to write an essay on elephants, and one Soviet kid proceeds to write a long paper entitled “Russia: The Homeland of the Elephant.” Cue the laughs, because obviously Russia is by no means considered a natural habitat for the huge mammals, and the child was simply displaying his patriotism – so it’s funny because it isn’t true. Except, ironically, it turned out the kid may have been right after all, and ancient elephants did once inhabit the country. One of the few museums to exhibit not one, but two complete skeletons of the Southern mammoth — the ancestor of the ancient mastodon — is located in Russia, too. The huge animals roamed the country from 0.7 to 2.6 million years ago. The unique exhibits in the City Museum of Stavropol in Russia’s Northern Caucasus region (1,400 km south of Moscow) are in fact discoveries of the palaeontologist Anna Shvyreva. There are in total only seven such skeletons in the world. The museum acquired is first Southern mammoth before Anna started working there. In the 1960s, a preserved skeleton of the animal was discovered in the Stavropol region. The locals quickly came up with a name for the animal, calling it Arkhip. Apart from the ancient elephants, Anna also found an elasmotherium. This is her real treasure, taking pride of place among her discoveries. Also known as the Great Rhinoceros of Siberia, the elasmotherium inhabited the Northern Hemisphere over two million years ago. Weighing over four tons, it was about five meters long and up to two meters tall. Fifty years ago – when Anna was already an employee of the museum – several curious animal bones were found near Stavropol: A skull with a bulging lump on its forehead, a humpy spine, and rows of long ribs. The discovery made the headlines. People were interested and visitors came to the museum in their droves. According to Anna, scientists only understood that they had found a very well preserved specimen, but were having trouble figuring out what it was. 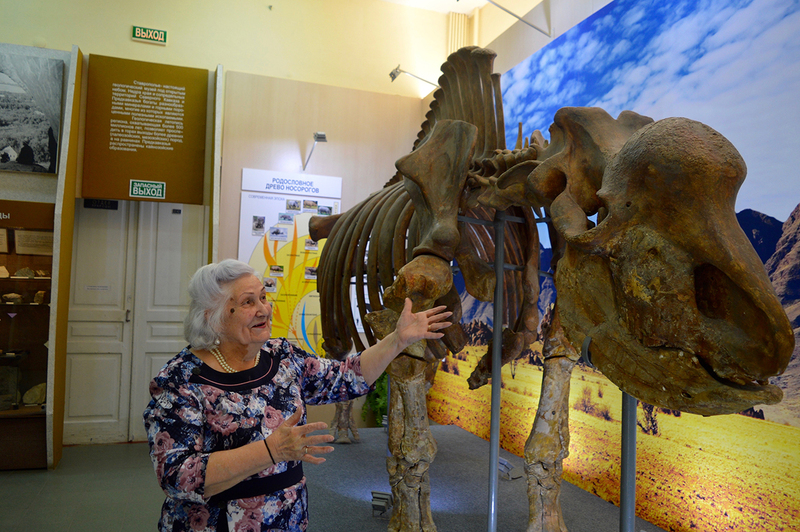 A couple of years later, Anna hit the jackpot yet again, as another elasmotherium skeleton was found in the Stavropol region. According to the palaeontologist, the animal likely met its death near a lake – she thinks it drowned in a bog while trying to drink.